Tangent line is shown as solid line and secant line is shown as dashed in the following figure. Generally, initial line passing through origin is used, but tangent at any point or average of two values taken at the points intersected by scant line drawn along the curve can be used. Except significantly small plates, it is very difficult to conduct plate load test as reaction load is necessary to achieve uniform deflection of plate. Even in case of small plates like diameter of (450~750) mm, it is not possible to derive δ conforming definition of Ks as plates shown tendency to be too rigid to produce constant deflection along the plate dimension. The rigidity can be increased to some extent by staking smaller plates placed concentric with underneath larger one, whatever measures are taken, the plot is done with load applied on load block derived by contact area (i.e. 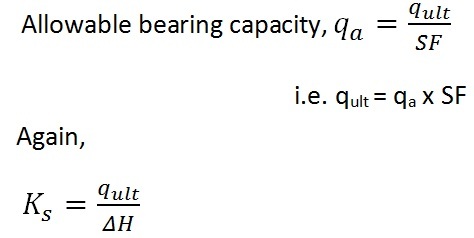 nominal value q =P/A) and average value of measured deflection. one can split q- δ plot into several potions so that modulus of subgrade reaction (Ks) attains it actual values on the slope of respective regions; but these approach will produce difficulty in analysis as it require too much adjustment into these problems. So, most analyses are based on estimated values or approximate load test. Some engineers don’t believe on this conceptual term, modulus of subgrade reaction, rather they prefer stress-strain modulus Es (and poisson’s ratio, µ) to apply in some types of finite-element analysis. But until precision in determining Es has been developed, application of modulus of subgrade reaction in finite element analysis is preferable as it offer greater ease in solving and significant saving in consumption of time in calculating with computer. Though there have direct relationship between Ks and Es. The main problem in this regard is to determine Ks value. 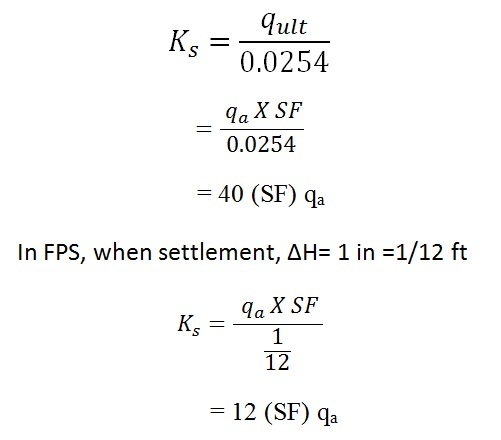 Terzaghi proposed some equations to determine Ks based on plate-load test for full-sized foundations considering size effects and soil type; but not recommended for general use. 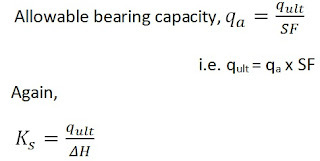 Bowels recommended following approximation to determine Ks based on allowable bearing capacity as suggested by geotechnical engineer. When ΔH is considered 6, 12, 20 mm and so on, the factor 40 or 12 should be changed to 160, 83, and 50 (48. 24, 16 for FPS). 40 is considered sufficiently conservative, but one can choose smaller displacement. Either As or Bs may be zero in this equation; at ground surface As=0 for lateral Ks but As>0 for any small depth. In case of footings & mats As>0 but Bs≈0. Several hundred words have been included, but what about significance of modulus of subgrade reaction? Significance of this term will be discussed in two categories; for footings and raft foundation and for deep foundations like piles and sheet piles. The previous discussion is essential to explain these. When mats or combined footings are considered rigid, we can solve this without modulus of subgrade reaction. But when flexibility is considered, the inclusion of modulus of subgrade reaction is required whether it may approximate flexible method or discrete element methods. In flexible methods for mat foundation, the approximate method was recommended by ACI committee 336. 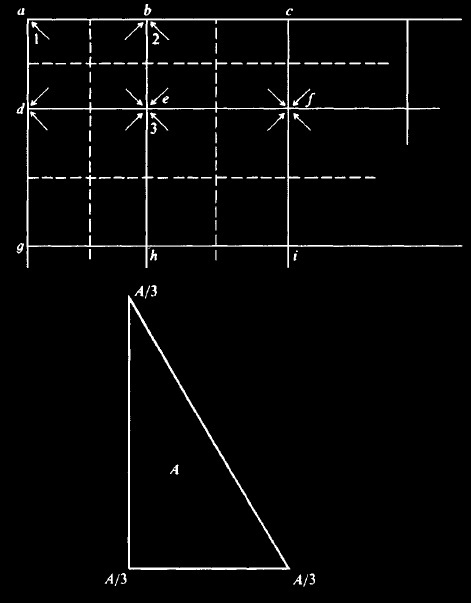 Plate rigidity is measured depending on geometric property, poisson’s ratio and modulus of elasticity of concrete. Effective stiffness radius is determined and then tangential and radial moments, shear and deflection are determined. The radial moments (Mr) and tangential moments (Mt) at load point are found in polar co-ordinates are then converted into rectangular co-ordinates Mx and My referred to origin. This conversion and shear deflection depends on influence radius as discussed above. Above three discrete element methods use modulus of subgrade reaction Ks to support plate. These methods are required to calculate node springs depending on contributing element area in the plan of footing to a node is shown in following Fig. As above computation yields units of a spring, it is generally called effect of node spring. Unit will be KN/m, for FPS unit system it will be Kips/ft. In such form, springs are not dependent on each other and these springs are not coupled. Thus plate is supported by this system of springs and as recommended by Winkler (1987) to consider foundation as bed of springs (classical Winkler solution), this system termed as Winkler foundation. Uncoupled springs means, any deflection of a spring is not a influence of adjacent springs. According to Boussinesq’s analysis it can be said that contact pressure at base has contribution to settle other points. This means a flexible base, loaded uniformly, subjected to more settlement at center than that at edges. Application of constant Ks over a uniformly loaded rectangular base will result also a constant settlement (ΔH) when we calculate node springs considering contributing area under nodes. This approach is discrete elements methods is off course incorrect; for this reasons many engineers do not agree to use Ks. 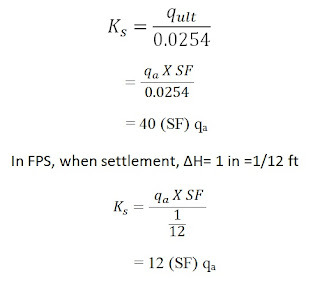 In simple words, settlement under a base is coupled but these soil springs computed from Ks are not coupled. Some designers, instead of Ks prefer elastic parameters µ and Es to use in FEM of elastic continuum. The uncoupling problem is solved to some extent, but computation effort is increased extensively and refinement is function of accurate estimation of µ and Es. Again only terms associated with diagonal translation are effected with the Ks in spring concept. Ks has widespread use in analyzing mat foundation because it offers greater convenience. 2. The higher value of Ks can be provided at ends by zoning; and transitioning to minimum value at central zone. This can be expressed as to provide softer springs in central or the inner most zone which transition to outer zone. Generally, weight of mat should be considered in analysis. Self-weight of mat doesn’t result internal bending as mat is poured with concrete directly on subgrade, moreover in plastic condition, concrete takes the shape of irregularity remain on surface before hardening. The deflection measure in analysis will be more when self-weight included in calculation as soil springs subjected to reaction of all vertical loads. Early designers of pile used to design pile assuming loaded only axially. To carry lateral loads better piles was introduced. Power poles, sign posts and marine piling are represented as piles embedded partially which are subjected to lateral loads and need to be designed as laterally loaded piles. Current design principle considers laterally loaded piles as full slender batter or vertical structural members loaded laterally, partially or fully embedded into ground. Early developed analysis method for this type of pile is finite-difference method (FDM). Now finite element method (FEM) offers us significant improvement; FEM offers to analyze complete piles and moment of inertia can vary with length. The lateral program developed for lateral pile can be used to analyze lateral piers. Piers are nothing but pile with large cross section. • Where boundary conditions or forces are applied. It can be concluded from previous experiences that top third of embedded depth is generally critical for displacements and moments; thus segment length should be shorted in this zone. Usually 10~15 number of elements are sufficient having 4~8 element in upper third of pile embedment. Don’t place too short elements immediate below/above a too long element. A suitable method is used to calculate modulus of subgrade reaction establish a Ks profile as shown in following figure. 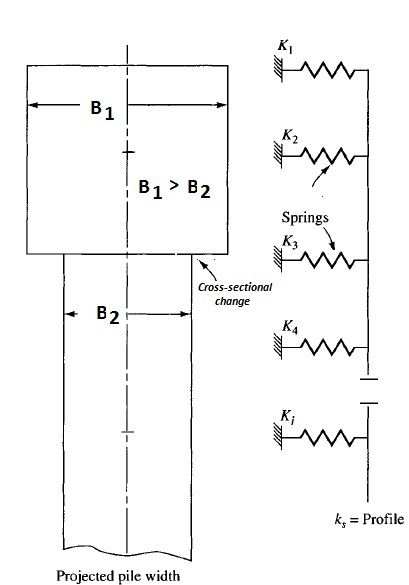 Node springs are estimated based on Ks;value and are contributing to particular node (Ac). Equation (1) can be used to calculate Ks. The Ks value can be changed for particular node as stratified soil profile is very common and Ks can only be determined from CPT or SPT data. Node springs are Ki determined as above are placed like following typical figure. It is usually accepted that lateral subgrade modulus (Ks) is reduced if piles are spaced closely. According to Boussinesq’s pressure bulb under rectangular footing, we can conclude that when D/B > 6, a negligible pressure increase is observed. Thus treating a clear spacing of pile S’ as depth D and projected width of pile as B, we can establish that when S’/B >6, no modification of Ks is required. 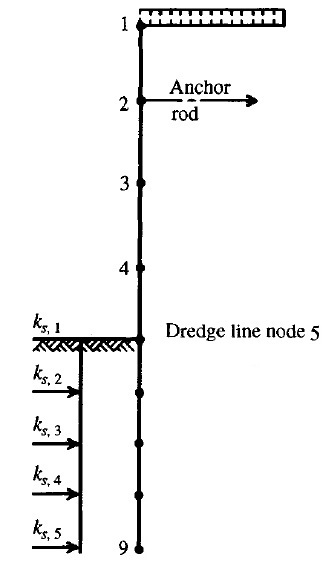 FEM model for sheet pile wall with selected nodes. N.B. node selection criteria is same as discussed in laterally loaded pile. Both anchor rod springs and soil Ks are provided in nodal entries. We can approximately determine Ks using equation (a) and (b). The safety factor, SF for cohesionless soils is 2 and for cohesive soils is 3. We can produce Ks Vs Z (depth) plot to find out best fit depending on foregoing equation Computer program based on FEM allows one to conduct parametric study varying pile section (I), Ks, depth of embedment D, location of anchor rod and other parameters. The preceding recommendations about Ks will result reasonably correct values of soil pressure at nodes and pile bending. Deflection of piles depends mainly on flexural rigidity (EI) of pile and Ks.Thus to determine a credible value of dredge line, a carefully selected Ks is essential. Determination of appropriate values are impossible as there have many variables and beyond control of designer. It is expected to have sufficient output data to design a pile with confidence to serve intended purpose.